The versatile GPX-4500 is a proven gold finder with many features and great performance. 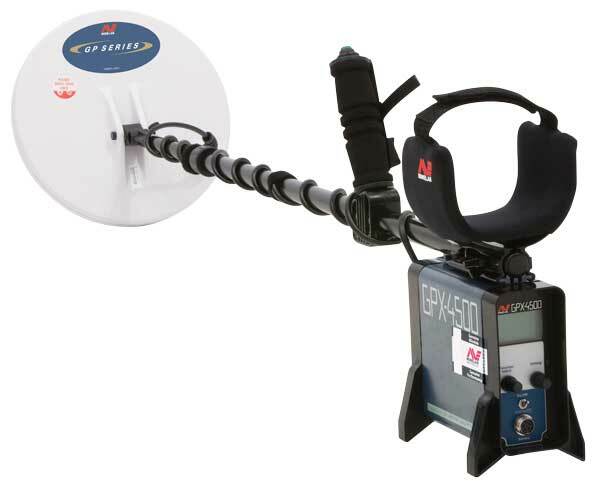 Incorporating Minelab’s superior Multi Period Sensing (MPS), Dual Voltage Technology (DVT) and Smart Electronic Timing Alignment (SETA) technologies it penetrates mineralised ground better and deeper than basic PI detectors. Return of the Legendary Gold Detector! MPS, DVT & SETA technologies for superior gold detecting performance. Versatile Timing settings for various ground conditions. The Enhance timing is a powerful feature, similar to the Sensitive Smooth timing, but provides an improvement in the depth and signal response on small and large targets alike. The Sharp timing is more suited to quieter soils and can also help to pinpoint faint targets. Six pre-programmed search modes for easy switch-on-and-go detecting. All six search modes can be modified with your favourite settings and renamed. Stabilizer control for the smoothest threshold. In noisy conditions, turning it down will provide you with a smoother threshold. In quiet conditions, increase the stabilizer and faint target signals will be more obvious. Ground Balance OFF for neutral soils. This is a useful feature for very benign low mineralised or salt saturated soils. This setting will also work well for treasure or relic hunters in loam or sandy soils. Backlight with adjustable time-out to preserve battery life. Target Volume allows you to increase the strength of softer target signals. This is useful in windy conditions, for people suffering from hearing loss, and to adjust the audio volume when using external speakers. This can also provide an audio boost in mild soils, and can be used to smooth out ground noise signals in highly mineralised soils. The Iron Reject function allows you to set the desired level of discrimination, from cautious to aggressive. This enables detecting in areas with high levels of ferrous junk. Built-in amplifier so you can hear soft target signals from deeper nuggets, more easily. The Li-lon battery pack includes a built-in audio amplifier, allowing you to use an external speaker without the need for any external booster. Audio Output: 6.35mm (1/4″) headphone/speaker jack. Headphones Supplied: Koss 100 ohm headphones. Visual Display: LCD screen 64×128 pixels, transflective. Backlight: Yes with adjustable automatic ‘time-out’. Memory: Setting changes saved automatically and remain until changed or reset. Factory Presets can be restored on start-up. Detect Modes: General, Deep & Custom. Custom Modes are: Hi Mineral, Hi Trash, Patch & Test A. Discrimination: Iron Reject: range 1 to 10 & All Metal. Timings: Enhance, Normal, Sensitive Smooth, Salt Course, Sensitive Extra & Sharp. Audio tone: Variable Control 1 to 100. Audio Type: Quiet, Normal, Deep & Boost. Ground Balance: Automatic Ground Balance, Fixed & Tracking: Slow, Medium & Fast. Ground Balance Type: General, Specific & Ground Balance Off. Sensitivity Adjust: Rx Gain 1 to 15. Tune / Noise Cancel: Automatic & Manual 0 to 255. Target Volume Adjust: Volume Limit 1 to 20. Battery: Lithium-Ion with built-in amplifier (up to 12 hrs). Supplied with mains and vehicle charger. Low battery alert: Audio alert. Length: 1100mm – 1300mm (43.3″ – 51.2″). Weight: 2.4kg (5.3lbs) (ex. battery). Warranty: 3 years control box & coil.